With summer rapidly approaching and daylight extending way past what we were seeing just a couple of months ago, the best way to end a day to head to Ward Pound Ridge Reservation. With clear blue skies and empty trails, this hike was as close to perfect as you can get. The start of today’s hike. A stream that runs next to the trail. Upstream just a little bit from the picture above. A register located on the DH Trail. This entry was posted in Uncategorized and tagged Hiking, Hudson Valley Hiking, hudson valley ny, Inner Peace, John Muir, john muir quotes, landscape photography, Music, peace, Photography, tranquility, ward pound ridge reservation, wilderness photography, wilderness quotes on May 21, 2018 by The Zen Hiker. I have been wanting to do a long(er) hike for a couple of weeks. With the exception of few hikes earlier in the summer, most of my excursions into the woods have averaged between 4-6 miles. As is usually the case, I know that physically it would not be an issue to do a longer hike, it always ends up being a mental one. Today, however, I really wanted to do at least ten miles. I decided that I would hike the Red Trail twice with a little extra on a side trip on a connector trail. The trail was so nice, I had to do it twice! Storms had moved through last night so I anticipated the rocks on the trail being a little slick. Besides that, the humidity was pretty low and the temperature was around 65 degrees. Pretty decent hiking weather! Back 20-25 years ago, hikes longer than 10 miles were not uncommon. At my advanced age of 52, however, I don’t want to do anything stupid to where I couldn’t hike due to an overuse injury. Since I really haven’t done any long hikes in some time, I thought today was the day! Please forgive this first picture, but I was even a little shocked when I took my boots off and this is what I saw! My crusty feet after 11.5 miles. The first moment when I realized that it was daytime! After hiking for about 3 miles, I thought it would be a good time to stop and eat some breakfast. After I finished the first loop, I took some time to change my socks and air out my feet. I also used this time to get my feet and mind psyched for the next loop. During the second loop, I almost stepped on this little guy. Luckily he didn’t run away until after I had snapped a couple of pictures. This entry was posted in Uncategorized and tagged Hiking, Hiking Pictures, Hudson Valley Hiking, hudson valley ny, peace, Photography, red trail, tranquility, Walking, walking as meditation, ward pound ridge reservation, wilderness photography on August 23, 2017 by The Zen Hiker. Today I decided to try hiking a little more locally than I usually do. Instead of traveling to Dutchess or Orange county, I went in the opposite direction to Westchester County. 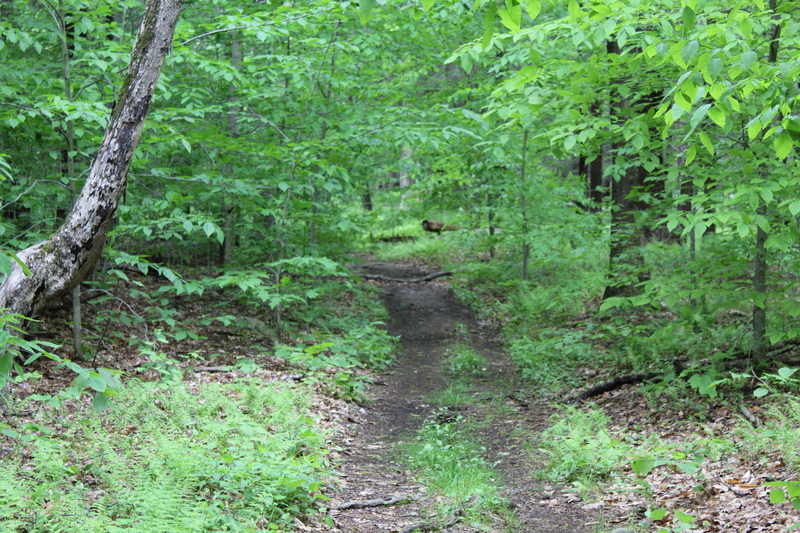 Located just off of route 121 in Pound Ridge, NY, Ward Pound Ridge Reservation offers many hiking trails, camping and picnic areas in what is truly a pristine area of the county. The standard warnings located on the opposite end of the Kimberly Bridge parking area. The Blue trail heading up towards the remnants of a fire tower. This is the spot where a fire tower used to stand. I am not going to lie, whenever I do a loop hike I look at the map and try to determine the easiest way to traverse it. Even though this hike started with a pretty steep climb, when I finished I was glad that I hadn’t gone the other way! If you look at the picture below, I took it after hiking down this section. If I had been coming from the opposite direction I would have had to scramble to get up this section of the trail. As with other parks in the Hudson Valley, these woods are filled with enough varied terrain and landscape to keep things interesting! An inchworm making its way to safety! The first half of this hike was a decent mix of soft earth, grass and rocks. The second half was all on a woods road. After climbing pretty steeply and then navigating some pretty tricky descents, the hiking was easy all of the way back to the parking area. The woods road leading to the parking area. When I finished, I did take the opportunity to sit on the bench to rest and enjoy the view. If you are looking for a place to hike and maybe have a BBQ or picnic, then this is the place for you. I don’t know how crowded this park is on the weekends, but when I was here today, it was very quiet. This entry was posted in Uncategorized and tagged Amelia Dashwood, Hiking, Hiking Pictures, hiking quotes, Hudson Valley Hiking, hudson valley ny, Inner Peace, janice anderson, katelyn s bolds, peace, Photography, pound ridge ny, tranquility, Walking, walking as meditation, ward pound ridge reservation, westchester county hiking, wilderness photography on August 9, 2017 by The Zen Hiker.